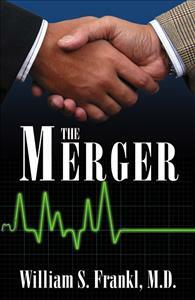 The Merger is a medical thriller, a fast-paced story of intrigue, corruption, suicide, and murder inside the offices, boardrooms, and bedrooms of physicians and administrators after two medical universities merge in a plot hatched by their Middle-Eastern CEO’s. The Merger is medical thriller and cautionary tale about patient care and ethics that are sacrificed for the bottom line when two medical universities merge in a plot hatched by their Middle-Eastern CEO’s. The alliance proves to be an ethical and financial debacle spiraling into a whirlwind of murder, suicide, and revenge. The novel provides a first-hand look into the back-room politics of corporate medicine. It’s a fast-paced story of intrigue and corruption inside the offices, boardrooms, and bedrooms of physicians and administrators, which culminates in a thrilling chase across three continents. In The Merger, Dr. Frankl proves he knows the political anatomy of hospital administrators as well as he knew the physical anatomy of his patients. He understands that in politics, too, a disease can be insidiously destroying the inner workings even while the facade still looks fine. Forceful CFO's, ego-driven experts, caring physicians --- what motivates these respected icons of society when their personal goals are challenged? If one takes the Hippocratic Oath pertaining to the ethical practice of medicine, is he obligated to ethical practice in other categories?